Russell & Kitty here. 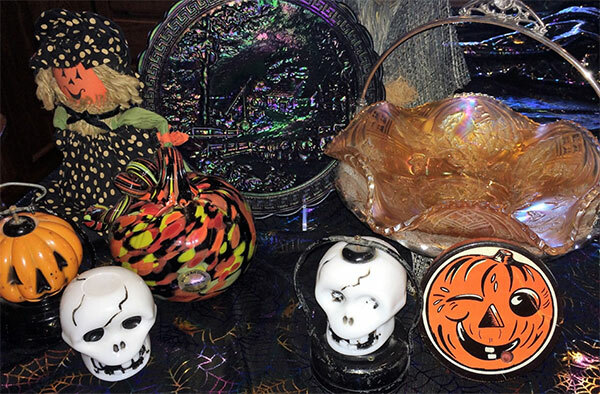 We hope that everyone is having a fun, but safe Halloween tonight. Even though our trip was in July and August, we are still trying to get everything back to a normal state if that is possible. Since the fire came so close to us, we have taken five truckloads of underbrush to the dumps. Yes we have muscles that did not want to be used! Plus we have two new additions to our family. It was so easy to adopt them; the fireworks started when we got home. At a medium size mall outside St. Louis, we found a pair of Northwood #657 candlesticks in a dark sapphire blue. Most glass companies made a type of celeste blue glass and then called a darker hue another color name such as cobalt. Northwood was different, they had sapphire blue in a number of different hues, so we say plain sapphire, light sapphire and dark sapphire. 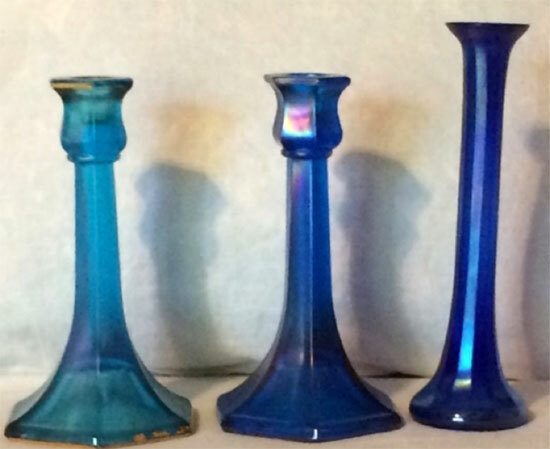 The following picture shows the difference between Diamond’s cobalt vase, Northwood’s dark sapphire candlestick and a plain sapphire candlestick. 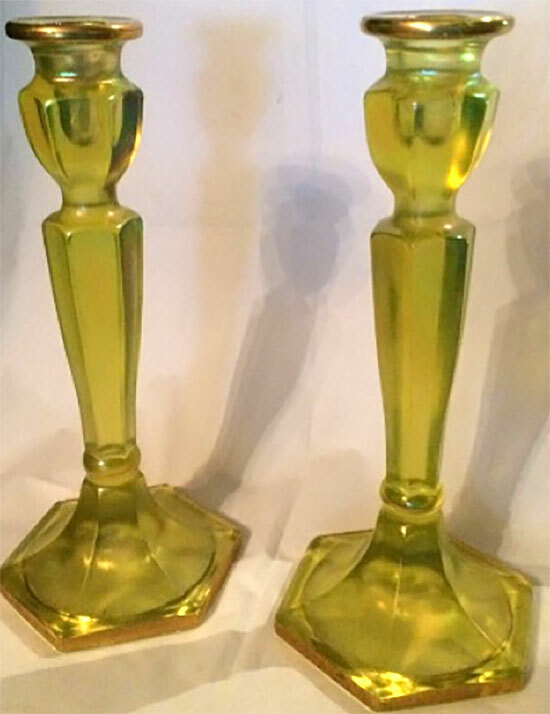 At a Fenton employee’s garage sale, we found a pair of Northwood’s #695 topaz candlesticks. He said that he had acquired them at the Fenton factory; Fenton did have other company’s glass in one of the back rooms. All of the companies did that so they would know what their competitors were producing. The items that were selling the best, they would make similar pieces. Consider the Colonial candlesticks that each company copied with little variations which drive us collectors crazy. Not many table items were made such as cups and glasses in stretch glass. This Florentine green tumbler was a happy find for us. Not sure who made it, but a guess would be either Diamond or Fenton. The pink tumbler was found at an auction. The pink paneled tumbler is from U.S. Glass Company, we think, because it is a painted piece. U.S. did a lot of painted glass; you can easily tell it is painted by looking at the clear base. Have always wanted a nice Wild Rose syrup. Usually the color is weak, but this one has good color. 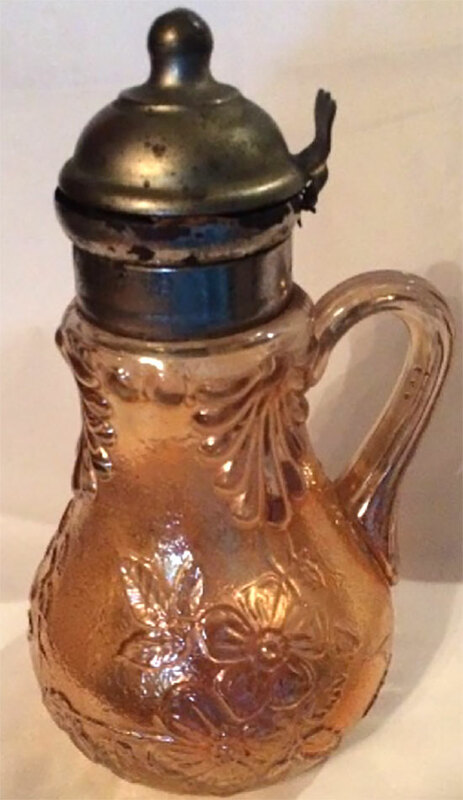 Sorry, but there isn’t any stretch finish on the pitcher; it is totally carnival glass. Found this little #2 Fenton creamer in marigold. It has an experimental finish that they must have been playing around with. The finish looks like ice crystals. The bottom was not finished because it is an experimental piece. It does have the Fenton number on the base. Found this weird celeste blue piece that truly is a whimsy. Think that it was someone’s birthday and an apprentice needed a gift. Some people have suggested a variety of makers, but we haven’t been able to track down any of the leads. The base looks like it was set on another piece of glass when it was still hot. Actually for the number of miles traveled and the number of shops we visited, we found most of the pieces that we purchased were at the glass conventions and around the Williamstown, WV area. We had hoped to find a lot of sleepers in our travels, but someone else had found them before we could!